Botanical Name of Holly: Ilex aquifolium. 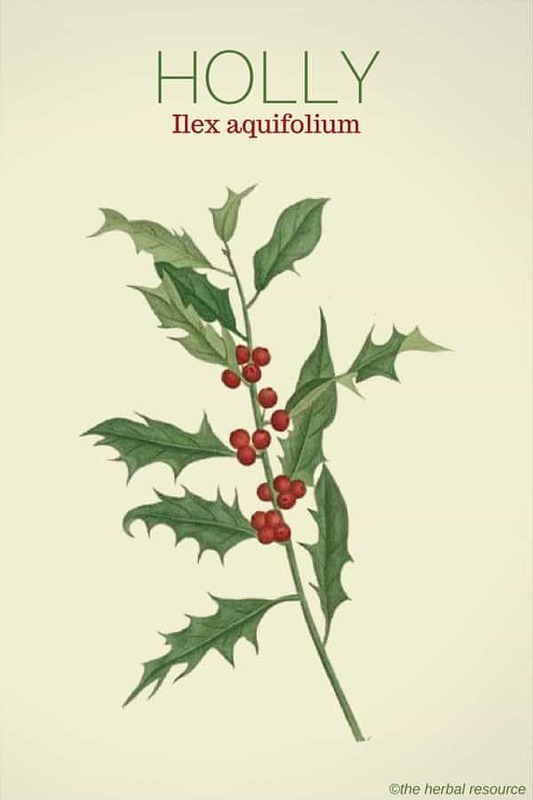 Other Common Names: Common holly, English holly, acebo (Spanish), kristþyrnir (Icelandic), Stechpalme (German), houx (French), järnek (Swedish), kristtorn (Danish), orjanlaakeri (Finnish). Habitat: Holly is native to western and southern parts of Europe, West Asia, and North Africa. It grows best in calcareous soil in moist and shady areas. The plant is often found growing wild as an undergrowth in oak or beech forest. Description: Holly is an evergreen tree or a shrub belonging to the holly family (Aquifoliaceae). It usually does not grow more than 6 meters in height, but old trees have been known to reach up to 10 meters. Holly has a pyramidal crown, which branches from the base. The bark of the young branches is green and shiny but light gray on older branches and stems. The wood is hard and dense and is often used for wood cutting. The leathery, dark green and shiny leaves can be oval (especially on older trees) but the young leaves have usually three to five sharp spines. Younger leaves are softer and have strongly curved leaf edges so the spines point in all directions. The flowers are white and four-lobed. Holly is dioecious so it produces both male and female flowers, which normally form on separate plants. From the female flower develops beautiful red firm fruit called a drupe that contains 4 to 5 hard seeds. The fruits, which often sit on the tree until the following spring, are eaten and spread by birds or rodents. The fruits taste bitter and are poisonous. Plant Parts Used: It is the fresh or dried leaves that are used in herbal medicine in the form of tea or alcohol-based extracts. The leaves can be harvested all year round and used fresh, or they are collected late in the spring and dried for later use. The fruits are poisonous and should not be used medicinally. 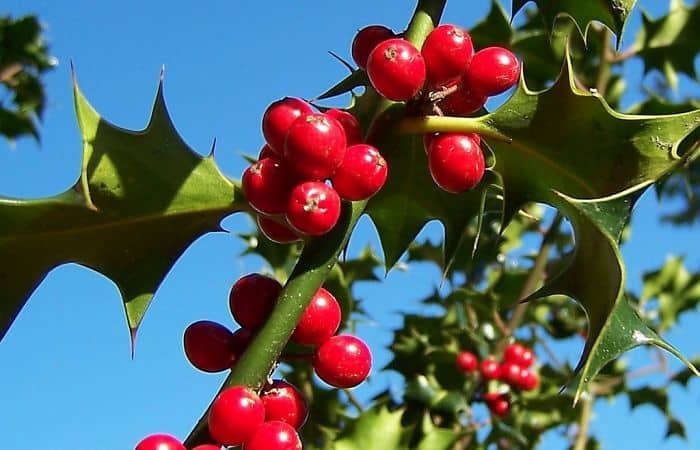 Active Ingredients and Substances: Holly contains triterpenes (alpha and beta amyrin, ursolic acid), flavonoids (mainly kaempferol, rutin, and quercetin glycosides), nitrile glycosides (menisdaurin), a bitter alkaloid called ilicin, phytosterols (betasitosterol, stigmastrol), caffeic acid, chlorogenic acid and traces of theobromine (in the leaves). The bark contains tannins, pectin and a yellow dye (ilixanthin). Legend has it that the crown of thorns place on the head of Jesus before his crucifixion was made from twigs cut from holly and the red fruits symbolized his blood. Holly has had a place in rituals and religious ceremonies for thousands of years. Because the leaves stay green in winter the Celts and Anglo-Saxons beveled it was surrounded by a mysterious force. In many countries, it is tradition to make Christmas ornaments with holly and wreaths placed above entrances was said to bring happiness and goodwill. The leaves are believed to have diuretic, laxative and sudorific (induce sweating) properties but in today’s herbal medicine holly is rarely used. The herb has sometimes been used internally in the form of a hot tea to reduce fever, treat bronchitis, common cold and some digestive disorders. It is also thought to be helpful as a blood purifying tonic for chronic rheumatic ailments and disorders. In addition, an extract made from the fresh leaves has been used to treat jaundice. 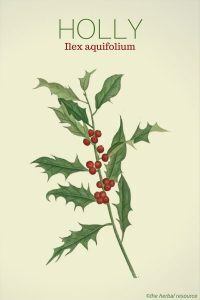 The leaves of holly do contain the stimulant substances caffeine and theobromine but not to the same extent as yerba mate. The fruits have different properties to the leaves. They are rather poisonous and can cause severe vomiting and diarrhea (emetic and purgative), but despite this, they have been used traditionally as an herbal remedy for dropsy or edema (fluid retention). Furthermore, the powdered fruits have an astringent (contracting) effect and have been used to halt bleeding. Due to the fruit’s toxic effects, they should not be used internally. As of yet, there are no proper standards available when it comes to the dosages and doses of holly as a medicinal herb. A common dosage based on traditional use is often two or three teaspoons of the dried leaves added to a cup of hot water. This herbal tea is usually consumed a few times per day. A liquid alcohol-based extract made from the leaves can also be used. When the herb is used in this form, several drops can be ingested daily. No contraindications or side effects are known in conjunction with the proper use of the leaves of holly in therapeutic doses. Information on the safety of the herb during pregnancy is not available so caution is advised. The fruits are poisonous and consumption of more than five berries can cause digestive disorders, nausea, vomiting, diarrhea, and sleepiness. Consuming 20 to 30 berries or more can cause life-threatening inflammation to occur in the digestive system but there have been no confirmed reports of poisoning of holly in recent times.